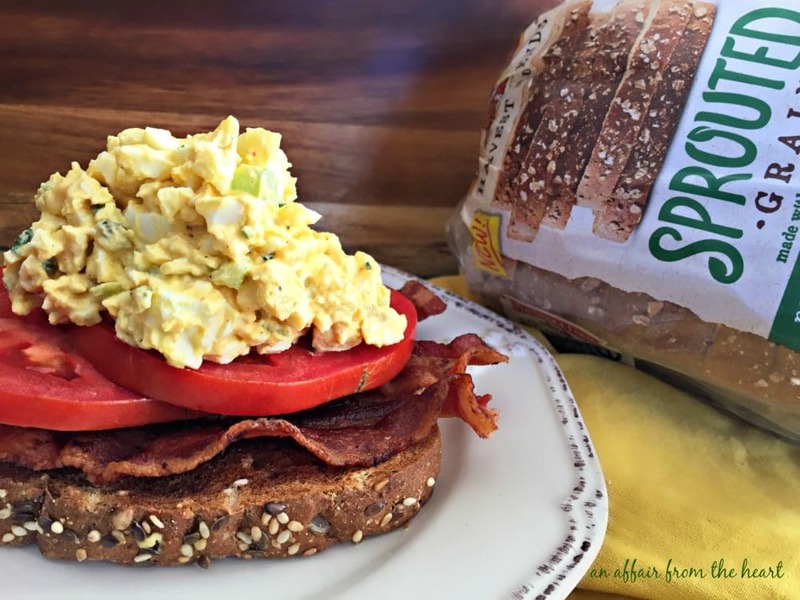 Fresh egg salad, ripe tomatoes and smoked bacon on toast. My two favorite sandwiches combined into one colossal sandwich that is out of this world! This post is sponsored by Pepperidge Farm® in conjunction with Blog Meets Brand and I have been compensated for my participation. However, all opinions are my own. Thank you for supporting the products that make An Affair from the Heart possible. If I had to tell you my favorite sandwich, it would be a toss up. 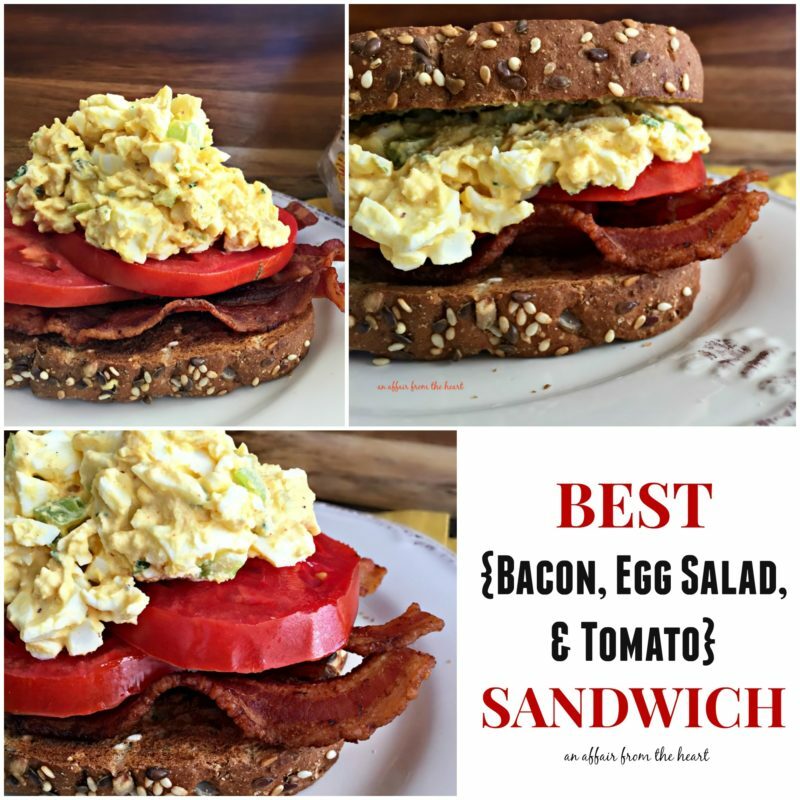 I LOVE BLT’s, especially with a nice ripe homegrown tomato, and I LOVE a good egg salad. Both of which I think are only made better on a good hearty toasted bread. So, why not combine the two? I know, why didn’t you think of that before? 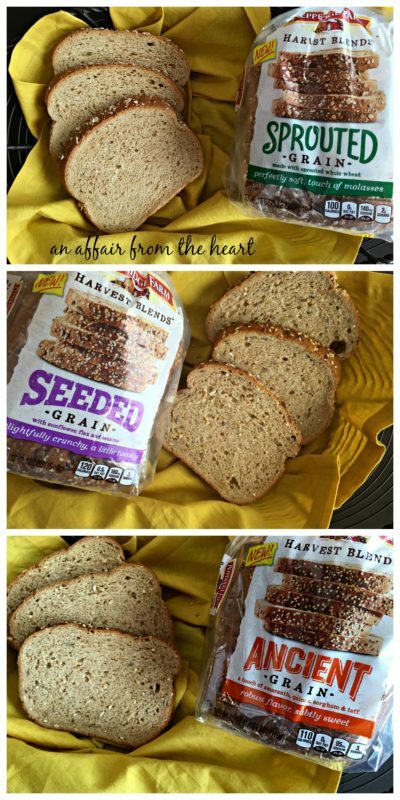 Recently, I was given that chance to try Pepperidge Farm Harvest Blends™ bread. The breads taste home baked, and come in three delicious flavors. Sprouted Grain: Soft wheat bread sweetened with molasses. Seeded Grain: Lightly toasty with sunflower, flax and sesame seeds. Ancient Grains: Bold flavor with a subtle sweetness, made with both quinoa and sorghum. Hearty bread that tastes good and is also good for you! 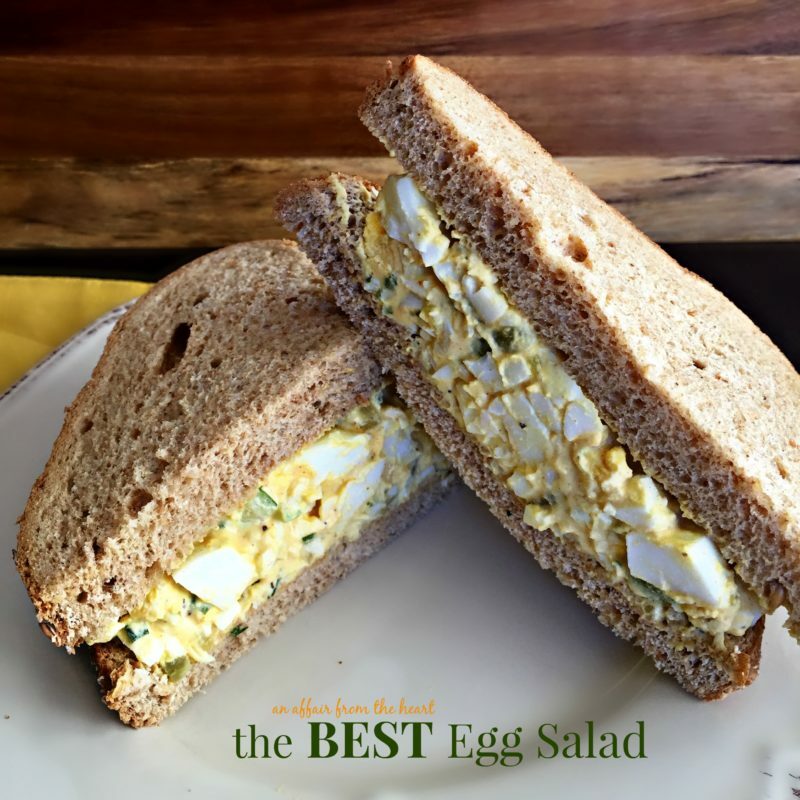 I thought this would be the perfect time to share my recipe for the BEST egg salad with you. I can’t believe I have never shared it before? Last week I mixed up a batch of egg salad for the hubs and I for lunch. I make, I guess, what you would call a quick base recipe, that only has a couple of ingredients, then sometimes I ‘jazz’ it up a bit. Really depends on time, and what I have in the fridge. The base recipe is hard boiled eggs, mayo, mustard, sweet pickle relish and salt & pepper. Jazz it up with some chives, celery and paprika. Don’t struggle with cooking the perfect hard boiled egg, it’s really very easy! I made a big bowl of it, because I knew we had a football game right after school, and dinner would be rushed. 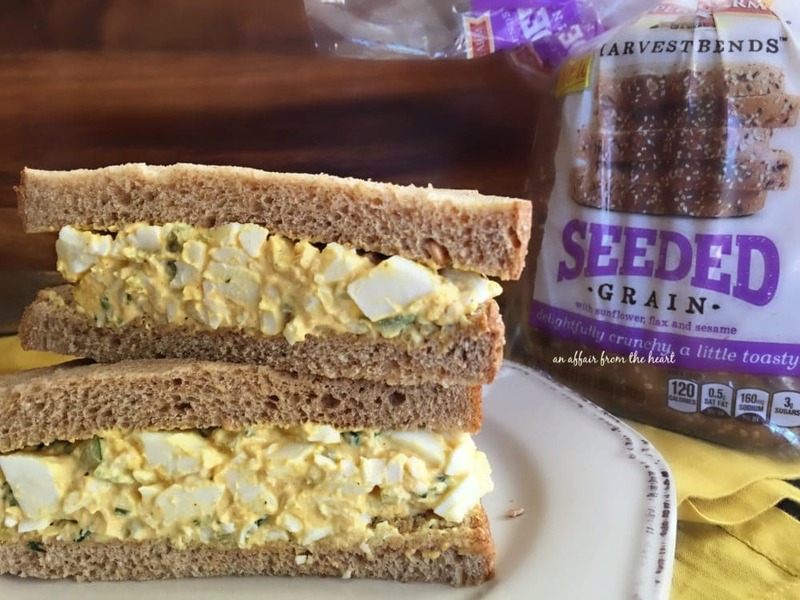 So, lunch was egg salad on the “Pepperidge Farm” Seeded Grain bread. I loved the nuttiness of the sesame seeds. 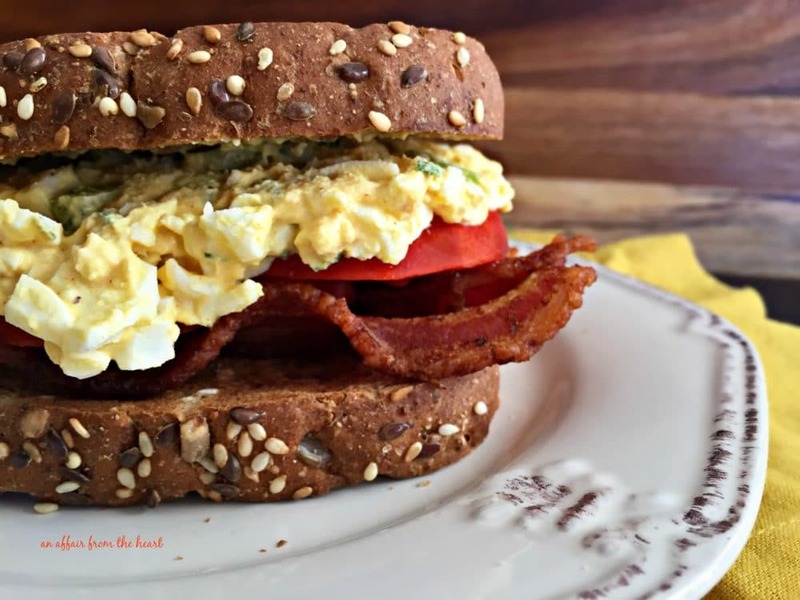 Then, dinner was toasted Sprouted Grains bread with smoked bacon, red ripe tomato slices and more of the BEST egg salad. Oh my word!! So good! Serve it up open faced with a fork and knife, or top it with another piece of toasted bread. 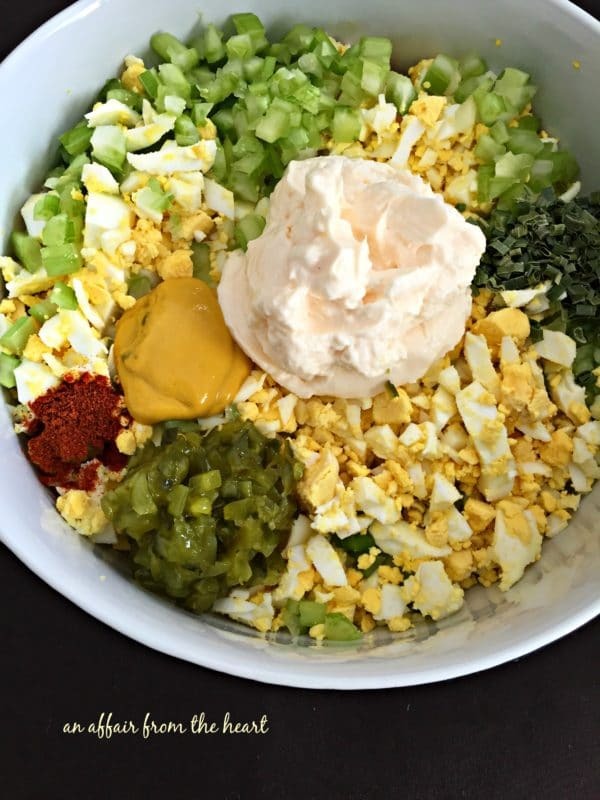 Fresh egg salad made with perfectly hard boiled eggs, mayo, sweet relish and yellow mustard. To make base recipe: Hard boil eggs, peel and chop them. Put them in a bowl and add to them the mayonnaise, yellow mustard and sweet relish. Sprinkle it with salt and pepper to your taste. Mix it up. Serve immediately or refrigerate until ready to use. Optional add-ins: add in some smoky paprika, chives or green onion, or give it a little crunch with the addition of some chopped celery. Want to give this great new bread a try?? I am giving away coupons for a free loaf on my facebook page over the next week. So, pop over and enter to win “Pepperidge Farms” Harvest Blends! This sandwich has me drooling. I love everything about it, and can’t wait to try it. Pepperidge Farm is one of my go-to breads too! This sandwich is everything I love! You’re egg salad sounds amazing, I love the tang that mustard gives to egg salad! 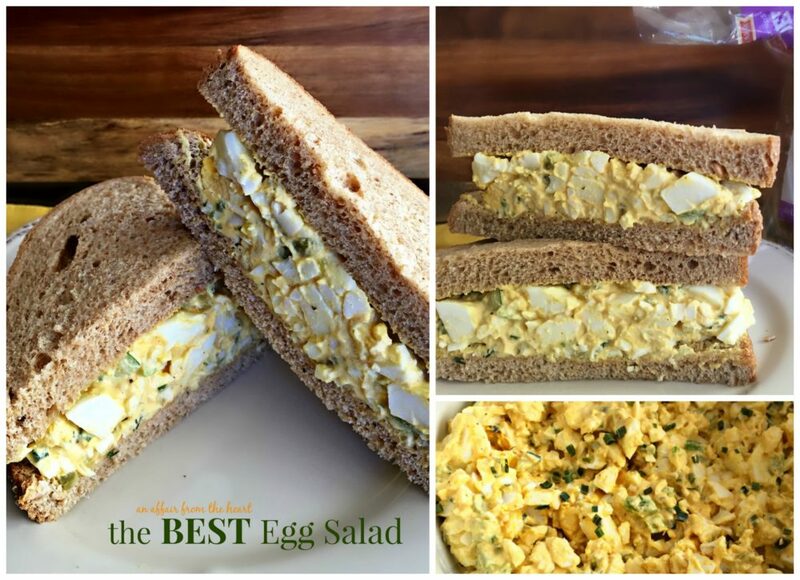 I love this – Egg Salad is one of my favorites and yours sounds delish! This sandwich is calling to me. I want it for breakfast, lunch, and dinner!! 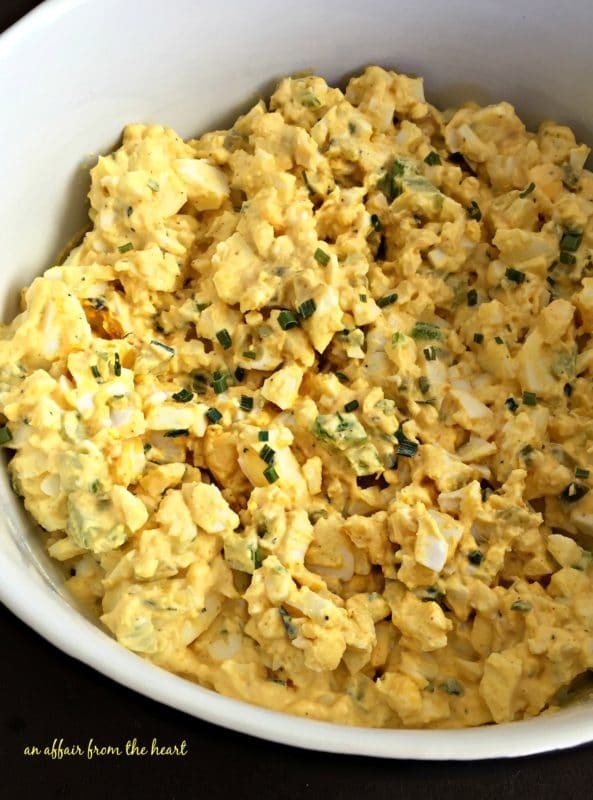 Your egg salad is packed with flavor, wow! And I really need to find this bread, I love a hearty bread and one made from ancient grains sounds great! This is AMAZING! 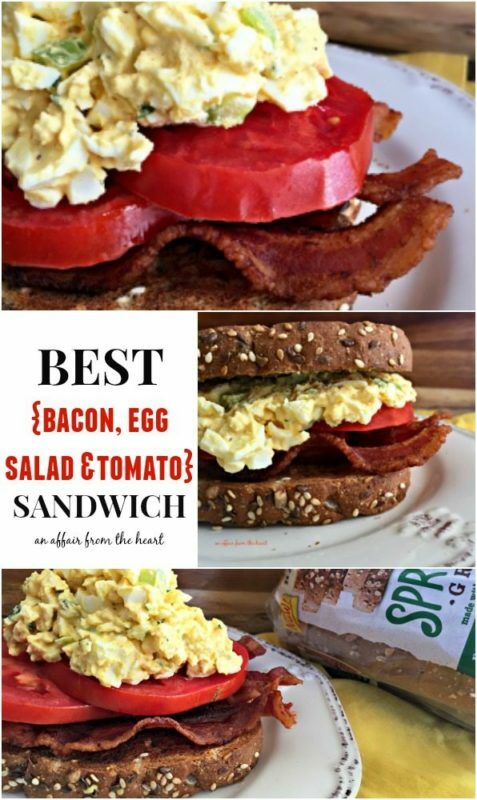 I don’t know why I never thought to add bacon and tomato to an egg salad sandwich, but this is happening here next week! Thank you!!! Also, I had to add, I made your egg salad the other day and it was GONE that same day! Literally the best egg salad I have ever had! I will look for this bread! Thank you! I love breads like this…I’m keeping an eye out for it! This might be lunch today! Pepperidge Farm has always been one of our favorite bread brands. Your sandwich creation here has taken an already great food product to an even higher level. Your photos are especially enticing and we love your choice of ingredients for this sandwich; fantastic job!!! WOW this looks great! I love sandwiches like this, and I think this one is perfection on a plate!! Awesome work here! 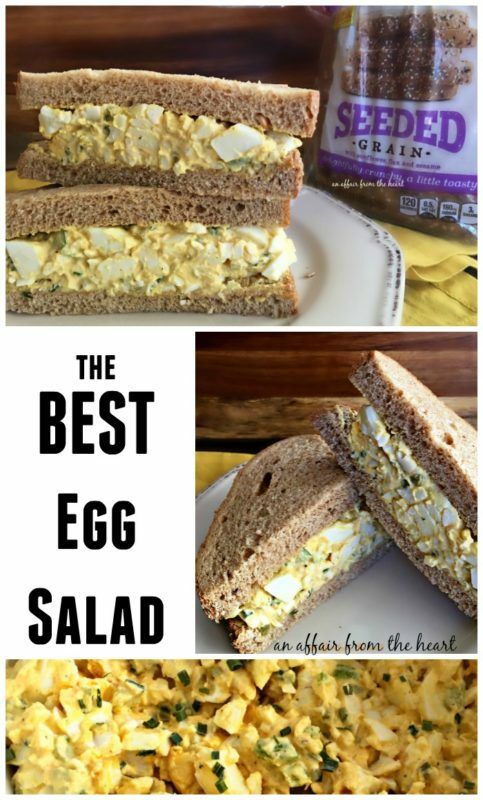 I LOVE egg salad and this sandwich combo sounds phenomenal! I love a great egg salad recipe. I struggle with making the perfect boiled egg. I have even tried the baking method too. Sometimes I get frustrated and just buy my egg salad. But this is a whole other level. That bacon and tomato just makes it a full meal! I love it!